A unique collaborative initiative between citizens, wildlife researchers and the forest department is monitoring and collecting data on wildlife, particularly leopards, in Aarey Milk Colony in Mumbai. The Waghoba temple in Mumbai’s Aarey Milk Colony houses an idol of a big cat. Resembling a tiger, the idol is worshipped by tribal communities living in the area. A few metres away, a new statue is set to be inaugurated in Aarey – that of a leopard – in reverence of the feline residents that the locals share their space with, in the 13 square km Aarey Milk Colony. The leopard population in Aarey Milk Colony (AMC) is small and often studied together with the leopards in the bordering Sanjay Gandhi National Park (SGNP) which has one of the highest density of leopards in the world. But with Aarey now a proposed site for a metro project, the wildlife of AMC specifically, is in focus. The green patch in the midst of urban Mumbai’s western suburbs is identified for a metro car shed for the Mumbai Metro Rail Corridor line from Colaba to SEEPZ (Special Electronics Export Processing Zone) in the Andheri East area, which runs between south and north Mumbai. The Environment Impact Assessment (EIA) report2012 for the proposed metro project in Aarey stated “no wildlife has been observed at project site”. But camera traps show otherwise. A group of researchers and wildlife enthusiasts, in collaboration with the forest department, has diligently been recording data of wildlife, including the elusive predators that have made Aarey their home. In Aarey, at any given time there are about four to five adult leopards, including a transient population that moves between Aarey and SGNP. Four adult females, Adarsh Nagar, Bindu, Chandani and Luna have been regularly showing up in data recorded over various periods since this specific monitoring activity began in Aarey in 2015. The initiative is led by a mixed group consisting of wildlife biologist Nikit Surve, honorary wildlife warden Mayur Kamath, journalist Ranjeet Jadhav, researcher Rajesh Sanap and team members Imran Udat, Kaushal Dubey, Prabhu Swami, Hitendra Pachkale, Sudam Nawale, Kunal Chaudhary, Satish Lot and Shahid. Some of the members were familiar with awareness programs through their former work with “Mumbaikars for SGNP”, a forest department and citizen initiative to deal with human and leopard interaction in the neighbouring national park. The Indian leopard (Panthera pardus fusca), is listed in Schedule I of the Indian Wildlife (Protection) Act, 1972, providing it the highest level of legal protection. Leopard falls under the near threatened category of IUCN (IUCN 2014) and remains in the Appendix 1 of CITES. “Leopards are among the most adaptable species of cats and are found everywhere. They are comfortable in close proximity with humans,” said Dr. Vidya Athreya, scientist at Wildlife Conservation Society India and expert in human-leopard interaction, emphasising that leopards living in close quarters with humans is a common occurrence. Adarsh Nagar, named after a locality in Mumbai which she frequented, was observed in Aarey for close to four months between 2012 and 2013. While leopards usually prefer to stay hidden, Adarsh Nagar was “quite a bold” leopard, according to Rajesh Sanap, a researcher with the team. “There was a time when a team from BBC was visiting Aarey to get some footage for a documentary on leopards. Adarsh Nagar walked on the road for hours while the crew followed her, filming her,” he said. Most leopards are okay with the presence of humans, as long as they have spaces to go into hiding, said Sanap. This is significant in the wake of upcoming infrastructure projects in the area. Leopards are likely to be comfortable coexisting with people that the projects bring in. But the absence of natural cover is what could drive leopards into human-occupied spaces and create chances of conflict. “There are tribal communities, new housing societies and Film City in and around Aarey. And there are leopards. We can’t remove any of them from the area. Our efforts are to work towards coexistence,” added Ramgaonkar. 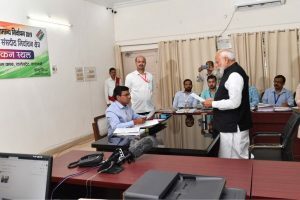 The Thane Forest Department has control over forest related issues and wildlife cases in the area, but Aarey specifically is not a notified forest and is under the administrative jurisdiction of the dairy department. Aarey however, comes within an ecosensitive zone around SGNP, identified by the government in 2016. Bindu was first spotted by the team in Aarey in 2011 when she was a cub. Even then, she was a curious creature, closely following the team members after they spotted her. Bindu was shy but always had an affinity for human-dominated landscapes. From a five-star hotel to housing societies and even a film set, Bindu was often spotted roaming the concrete jungle that came up in and around Aarey. There were multiple attempts to relocate Bindu to the core SGNP area but she made her way back to Aarey, establishing it as her home, alongside her human neighbours. Monitoring Bindu was an interesting study in leopard behaviour for the team, given that Bindu had such a unique personality. But are leopards usually so comfortable around humans? “The area where the Royal Palms housing society, where Bindu has been spotted, is located right between the Aarey Milk Colony and Sanjay Gandhi National Park. It is likely that this site was a corridor for leopards moving between Aarey and the national park,” said Sanap. Leopards do not imagine boundaries the way humans do. For Bindu, the housing society location was still part of the territory she regularly traversed. Leopards can share spaces with humans as long as prey population (both domestic and wild) remain sufficient and their habitat is protected. In Aarey currently, the Warlis, an indigenous tribe inhabiting the area appear to accept the presence of leopards as a normal occurrence. They also appear to know about the behaviour of the animal. The knowledge and information of how to avoid conflict with leopards and peacefully live with them is being passed onto them over generations, according to a 2018 report on leopards in Sanjay Gandhi National Park and its surrounding areas, by wildlife biologist Nikit Surve in collaboration with the director of SGNP, Anwar Ahmed. “The tribal communities have a deeper understanding of their wild neighbours which automatically creates deeper empathy and enables them to share the space and coexist peacefully,” said Athreya about the established tribal communities living in Aarey for decades. For the newer population that has moved into and around Aarey, the data collected by the team is key in building awareness. “We have camera traps that show humans and leopards in the same location at the same time,” said Surve, who is conducting this research as part of his post doctoral studies. 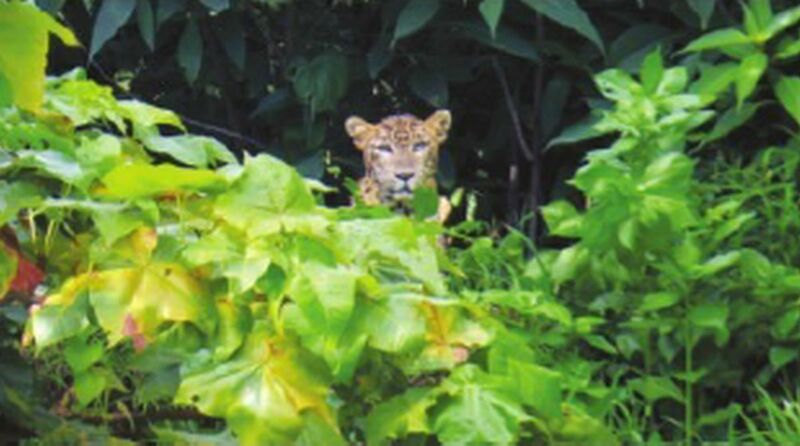 “The people may not even be aware that was a leopard in that location.” Such data helps the team provide proof of human and leopard coexistence in their awareness programs. Three-legged Chandani was a veteran of Aarey, observed by the team over five years. In 2016, the traps laid out for catching wild boars was where Chandani met her end. “Chandani had one paw missing when we discovered her. There is a common misconception that injured animals attack human children. But Chandani was never known for attacking humans,” said Sanap. In fact Chandani had her own little cub, an unlikely occurrence for an injured female leopard. While humans feared that one day she would attack their children, the fear should have been Chandani’s. Her child too succumbed to a trap laid out by humans. Holding the fort for leopard population in Aarey, is the female leopard Luna. First spotted in 2015, Luna is the most documented leopard of the area. She has raised two litters in Aarey and has a third litter under her watch at present. Continued monitoring of Luna could give more insight into the leopards of Aarey, their behaviour and their adaptation to the landscape as humans take over. “Mumbai is now so populous and overcrowded that it is no more a congenial home for wild animals,” says the EIA report which gives environmental clearance for the upcoming metro project in Aarey. Dismissal of wildlife as “almost extinct” by such reports only highlights the importance of work that the team is doing in camera trapping and documenting visibly existing wildlife in Aarey. “With camera traps, we can identify the leopards – something that we can’t do manually,” said Surve, adding that conservation takes time and continuous monitoring with tools like camera traps over a long term will help understand leopard population better. “Through the data collection work, we get an idea of the movement of leopards. When there is a human-leopard conflict, the forest department is called in. Data helps us pinpoint which is the individual leopard involved in the conflict,” said Ramgaonkar. “We get good support from citizens. We share information about sightings. Through collaboration with people doing scientific study, we can help citizens understand leopards and not panic.” The team of researchers and volunteers has put together their findings in Aarey in a report to the forest department. Athreya feels that Mumbai can be a model for collaborative efforts by citizens, NGOs and government to deal with leopards sensitively. Given that leopards are found in urban areas all over the country – Gurugram, Bengaluru, Guwahati, Shimla and more cities – Mumbai’s success story could be adapted to other places. Surve too believes that Mumbai has pretty much an ideal situation in the understanding of leopards in urban spaces and handling human-leopard interactions. “Citizens are aware and often provide us information when they encounter a leopard,” he said. The media in Mumbai is also sensitised on the issue of human and leopard interactions and reporting has become more accurate, added Athreya. Leopards who have been coexisting alongside humans for a while in Mumbai, understand the habits and schedules of the residents and plan their activities to avoid interactions, explains Surve. “Removal of leopards from an area is not a solution because another leopard will always take over the space. You rather have a leopard that has been living there for a while because it has adapted to the residents,” adding that leopards have proven that they can coexist peacefully with humans, it’s the humans that need to reciprocate.